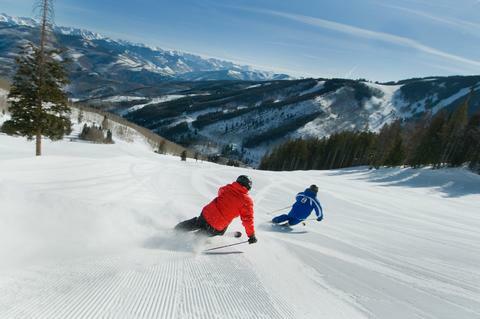 Vail is a goliath mountain with almost twice as many skiable acres as the next biggest. People who don’t ski have heard of Vail. And not without reason. Where to rent skis in the Vail Valley. Browse lodging options in Vail, Colorado. Photos and info about the Vail terrain parks. Find the best deals on Vail lift tickets. Find the best places to eat in the Vail Valley. Photos from around the Vail area. This is the most highly recommended resort/lodge in the Vail Valley. The accommodations here are luxurious, the facilities are phenomenal, and the in-town location is amazing. The Sonnenalp Resort is located on the edge of Vail Village. The on-site health spa has the best facilities in the village. There are several restaurants on the Sonnenalp property, and the in-town bus stops directly outside of the Sonnenalp. This ski lodge is located in the pedestrian mall of Vail Village. The slopes are located only a short walk away from this lodge. Many of the guest rooms here are privately owned and luxuriously furnished. This lodge is also the new home to Elway’s; a steakhouse owned by former Denver Broncos Quarterback John Elway. This is one of the most popular ski hotels in Vail. The Arrabelle is located less than a 1 minute walk away from the Eagle Bahn Gondola. There is a roof-top pool at this hotel that has pristine views of the ski slopes. The Arrabelle is located right in the heart of Vail’s Lionshead Village.